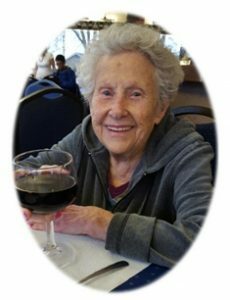 Marguerite Sherwan, (nee Stewart), age 96, of Port Washington, WI passed away on Tuesday, August 8, 2017 surrounded by her loving family. Marguerite was born on August 23, 1920 in Milwaukee, WI; the daughter of the late Walter and Martha Mros Stewart. She attended Center Street School, Riverside High School and graduated from the Wisconsin Art Academy of Milwaukee. She used her degree in fine penmanship and hand writing as a calligrapher for Gugler Lithographing Company in Milwaukee where she met her husband Earl Sherwan. They married in 1943. They moved to Sandy Beach in Belgium, WI shortly after the birth of their son, Todd, to set up home studios overlooking Lake Michigan. There she hand lettered titles of children’s books for the Whitman Publishing Company of Racine. Marguerite also worked in other mediums including painting and sculpting for Accents Unlimited, a plaster craft company creating everything from wildlife statues to plant and umbrella holders. She even created many Christmas ornament sets you painted yourself. Later she focused on a line of dog portrait note cards featuring Earl’s pencil drawings. These had been sold at specialty boutiques throughout the United States. This idea had been conceived during the time the couple had been breeding and showing Basenji dogs throughout Wisconsin at various kennel clubs in the 1960’s. Marguerite enjoyed a lifelong career in the arts, as well as, nurturing the many friendships made along the way. She was a true entertainer. There were few months out of the year she was not hosting family or friends at her home on Sandy Beach. Whether a holiday or Center Street Club gathering; many fond memories were made. She last resided at Anita’s Garden of Port Washington. She is survived by her granddaughters Jo Ann and Victoria (Todd Fischer) Sherwan, daughter-in-law Natividad Porges, great-granddaughter Kaitlin Hunter and great-great granddaughter Ava Hunter-Hess, all of Sheboygan, other relatives and friends. She is preceded in death by her husband Earl, her son Todd Sherwan and her brother Alexander Stewart. A celebration of Marguerite’s life will be determined at a later date. Memorials in her name can be directed to Anita’s Garden, 117 E. Van Buren Street, Port Washington, WI 53074. Always enjoyed delivering Meals on Wheels to Marguerite when she lived in Port. She was a hoot. She always would click her mouth and say “See you toots”. RIP.